I've been feeling like I am getting sick lately; I think it is just annoying allergies. But either way, I made myself a big bowl of miso soup last night, and the Pinterest pin I bade it off of has gotten quite a following. Way to go Men's Fitness Magazine for sharing this recipe, Haha!! It basically gave healthier alternatives for snack cravings, one being Ramen Noodles. I just boiled about 2-3 cups of water, added a touch of apple cider vinegar, a couple dashes of soy sauce, and a crushed clove of garlic or two. Add some cubed tofu, and some chopped spinach (instead of the seaweed), and any other finely chopped veggies you have on hand. Mushrooms would be great. If you'd like, add in some buckwheat soba noodles and let those cook for a minute. 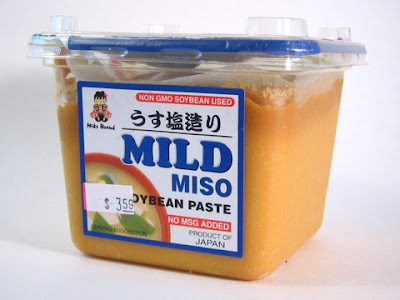 Then turn the heat to low and add a couple big spoonfuls of mild miso paste ( I found this in the refrigerated Asian section of Whole Foods, by the tofu. Note: don't buy the $18 non-refrigerated kind in the regular Asian food aisle. I don't know what that's about. I found the other one for like $4). Simmer and stir until the miso is dissolved. Top with a few sliced green onions, and serve. The fresh garlic and apple cider vinegar have great healing and immune boosting benefits if you feel a cold coming on. And the rest of the soup is just comforting and delicious!